The TRF419X runs really well on many surfaces. However on mid to high grip carpet the stock carbon chassis can make the car prone to grip rolling. 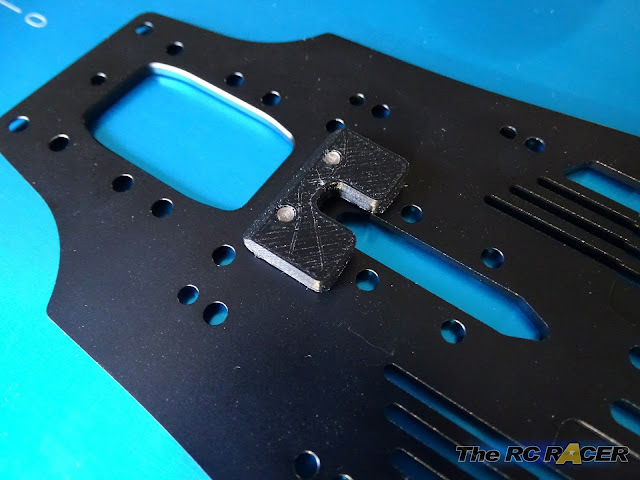 The aluminium chassis that was included in the TRF419X WS kit (Part no 13450822) is a great alternative, but it can be hard to source the part. 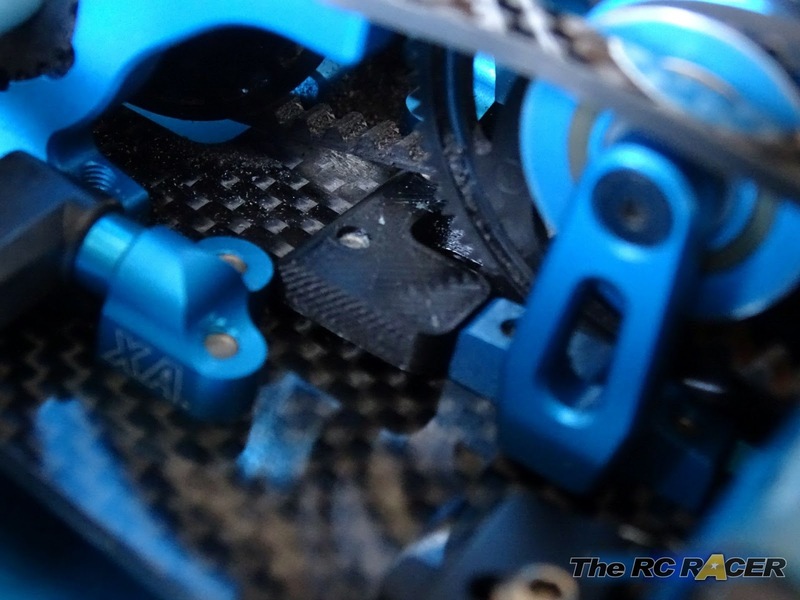 With that in mind I explored several options to change the flex characteristics on the stock carbon chassis. In the end after exploring different areas to stiffen up, I created a small part that improves the car when racing on high grip carpet. Its totally pointless on the alloy chassis, Its just for reference. As you can see in the picture above the brace is a small part that fits to the rear of the chassis. 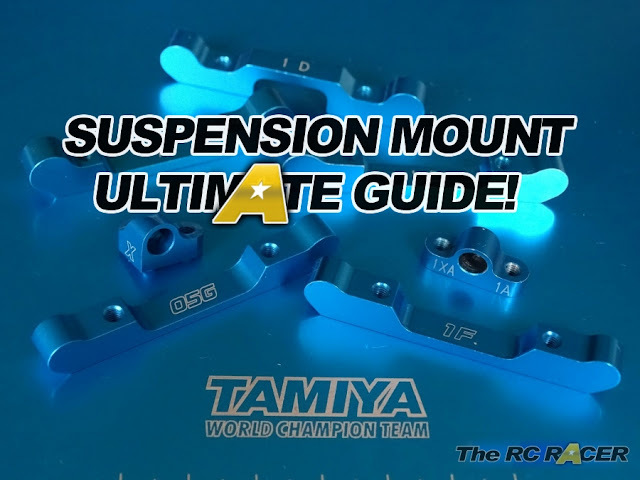 It essentially changes the footprint of the motor mount, in turn changing the way that the lateral flex works along the length of the chassis. Installation is easy as it just requires two 4mm CS screws. It does narrowly avoid the belt. Just ensure that you have removed any tweak once installed. After several test sessions, I was keen to see how this version of the brace would work, so it was time to hit the track. 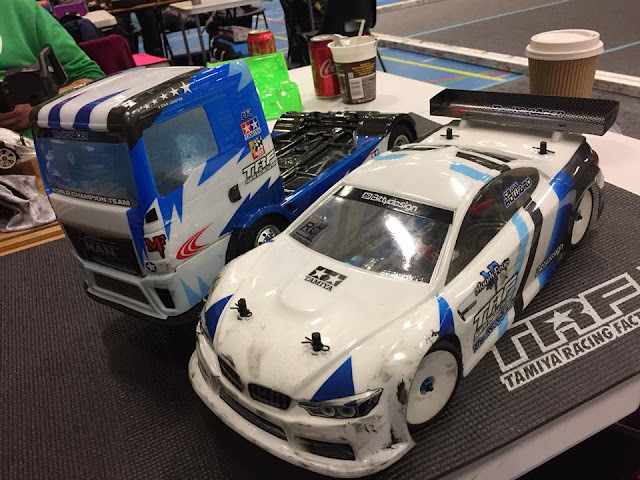 My local club is not high grip, more low-medium grip, however I had a larger regional Sunday event with a wide range of classes including GT12, LMP, Tamiya Trucks and importantly three full heats of 13.5 boosted TC. I was not expecting to win as I only run Blinky and I was really just keen to see how this version of the rear stiffener would work (It was version 0.7). Nothing special as I just got used to the track layout (Missing practice is my speciality). The car felt really easy to drive as the rear stiffener does calm it down, in truth I would have preferred the car to not have the part on as it just made the rear end totally locked down. I just tried to learn some of the limits of the grip of the tyres and look for fast lines. The last minute was a write off as someone collided with me so hard that the battery tape snapped so I had to retire. For the second round I was ready to get on it and really push the car. The grip had come up massively and the rear stiffener started to really work its magic. Whereas the car would be quite twitchy normally with this level of grip, it was really calm and if anything it was still maybe too easy to drive. However importantly I was really consistent and managed to be the third fastest overall. As I took pole position on the A I was very cautious that some of the faster guys would be all over me at the start of the race. As the buzzer went I launched away. Luckily the Fantom motor has a lot of initial torque and I soon arrived at the first corner. The grip was already there and I hooked around the apex and set off trying to build up enough of a gap on the infield to hold off the attacking boosted cars that were on my tail. For the first three laps it was very tense, but again the car was consistent and fast so I soon managed to gain a gap that gave me a false sense of security. I did the worst thing possible and actually just took it a little more easy, and after a few laps after clearing a couple of backmarkers I clipped an inner corner marker and rolled the car! It was in a bad position for the marshal, and when they managed to get to the car the second place driver had managed to get alongside me. It was the last corner before the long straight, however I had the inside so I used that to hug the apex and get a little bit of a jump on him as his turbo revved up. He soon caught me up but he was on the outside as we approached the first corner. I had to be the last of the late brakers to try to hold onto my position, so as he slowed to approach the corner I kept charging ahead and then quickly dabbed the brake and hooked the car onto the apex thanks to the great grip. This kept me ahead and I drove through the infield to increase the gap again and managed to hold on and claim the overall win by a few seconds at the end. 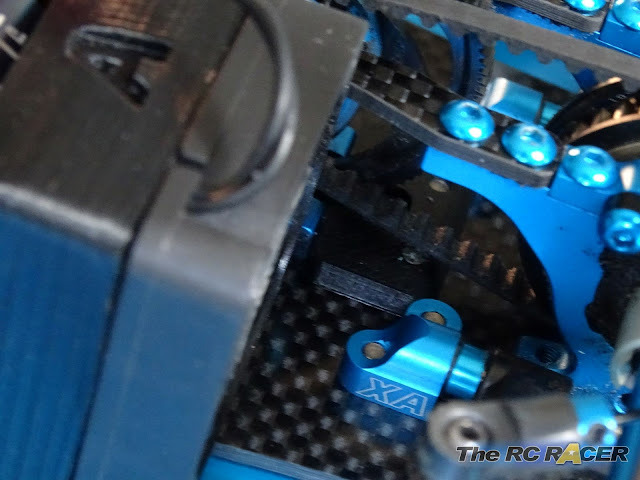 I was really happy how the TRF419X performed on that track. The rear Carpet brace did work well when the grip came up. It's totally not needed for most tracks but it seems to work well for high grip carpet. If I had a spare car I would have liked to have run a side by side test with the aluminium chassis. I would imagine that the aluminium chassis would be better as the whole deck is stiffer and the weight it also lower in the car. However I am really pleased at how effective this part has been. Its cheap an seems to work well. I've stuck it on the Shapeways shop. Again it is just a part for you guys to try. 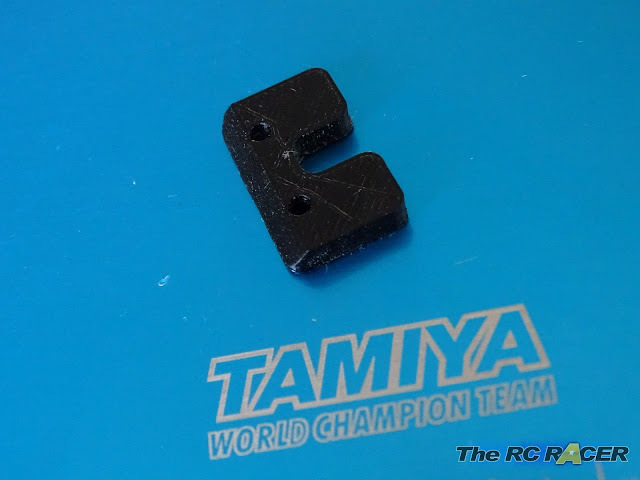 It's just for the Tamiya racing community. Have fun and let me know your feedback and I can try to modify it. It will work on the TRF419X, it will not fit on the TRF419XR chassis.